It’s that time of year folks when we dust off the blunnies, slip on the stubbies, don the akubra’s, thongs and sluggos and brave the elements for Philadelphia’s pre-eminent annual Aussie event. Due to the fact that we have a live act this year, we’ve moved to a new location this year to Cavanaugh’s Headhouse (for those of us who have been here longer than dirt, it used to be Dickens Inn, then Dark Horse Pub) down on Headhouse square. Map below if you need it. So we’re looking at the usual fare….pies, sausage rolls, Coopers, raffles, games…but mostly just a beaut excuse to get together and talk footy, cricket, bushfires and politics that no-one else here has a clue about. Absolutely everyone is welcome to join, (even those from Melbourne) and the billy lids can join in the fun. 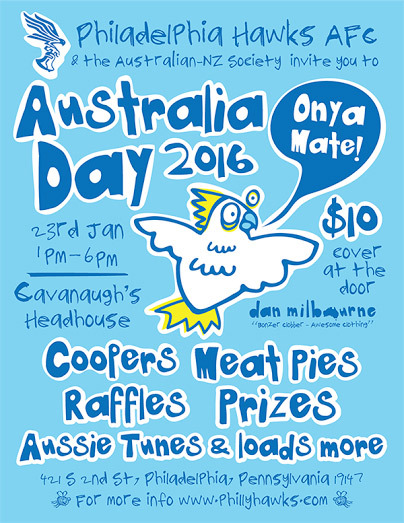 It’s a solid arvo of everything Oz so bring your Yank mates and give ’em a slice of home.